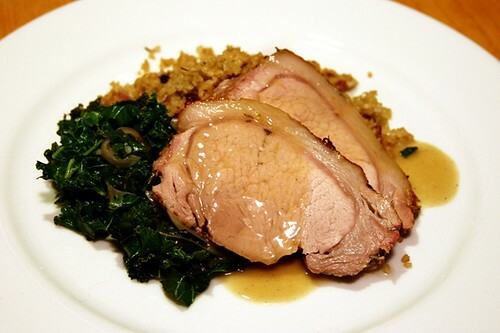 herb-rubbed pork loin roast with light gravy, coconut milk and black cumin bulgar wheat, and sauteed kale, originally uploaded by aarn! +10th February, 2010+. mashed up three cloves of garlic in a mortar and pestle, with a sprig or two of fresh thyme and rosemary, salt, black pepper, a splash of olive oil, and a pinch of white sugar. rubbed a trussed pork loin roast (locally raised, from the whole pig that was butchered) with this mixture, then placed the loin on a bed of quartered yellow onions and celery stalks in a cast iron skillet. placed the skillet in a 275-degree oven, uncovered, until the internal temperature was 150-degrees. pulled the skillet and roast and turned the oven up to 500-degrees. placed the roast on a rack on top of a baking sheet and threw it in the oven for about 5-minutes, until the outside had developed a nice crust. removed the roast from the oven and let rest on a plate covered in aluminum foil for about 10-minutes, until ready to serve. finely diced a small shallot and sauteed in a sauce pan with a little butter. added some crushed black cumin, a dash of nutmeg and marjoram, salt, pepper, and a pinch of korean chili flakes. dumped 1c. of dry bulgar wheat into the sauce pan, stirred around until coated in the oil and spices, and let sit on heat, stirring occasionally, until a nice nutty aroma was present. added a handful of dried chopped cranberries to the pan, and then poured 1c. of coconut milk and 1/2c. of water over the dry ingredients. simmered covered until the bulgar was tender, then mounted with 1T. with butter and served. de-ribbed a bunch of kale, then sliced into 3/8-inch wide ribbons, rinsed, and let sit in chilly water. strained the kale. sliced up and then sauteed a large shallot in a pad of butter. added a few cloves of olive oil poached garlic, salt, pepper, and a cup or so of sherry to the sautee pan, then placed the strained kale on top and let simmer. mixed the kale around until slightly wilted, and most of the liquid had reduced, then removed from heat. tossed with a splash of apple cider vinegar, to taste, and then plated. took the skillet, still containing the onion, celery, and roast drippings, and placed it over medium heat, until simmering slightly. added a splash of water, a sprig of thyme, 1T. of butter, and 1c. of sherry wine. let simmer and reduce for a minute, then added 1T. of flour, whisking until incorporated. salt and peppered to taste. allowed to reduce to a nice gravy consistency, then pressed through a chinois. de-trussed the roast, sliced it up, plated it, and slathered with gravy. I think that I can take credit for the kale. . . interesting idea for the bulgur wheat, I wonder how it panned out?